CPG Aeronautics.... » Vega’s maiden and follow-up launch: Textbook! Vega’s maiden and follow-up launch: Textbook! 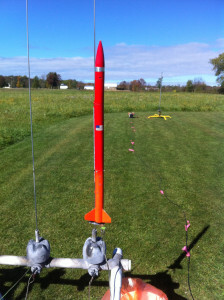 Perseus XR4-B rocket “Vega” had its maiden launch earlier today. This launch (PLS-047), and follow-up launch (PLS-048) marks the 47th and 48th launch of the Perseus rocket fleet, and the first dual deployment design for the mid power X4 rocket family. Both launches were ‘uneventful’ in the sense that nothing unexpected occurred. Vega’s launches was also used to test parachute packing methods. The maiden launch used a method with the idea of more reliable inflation right at deployment. It worked flawlessly. Flight #2 used the old technique I’ve been using, and the result was familiar…a late parachute deployment. This is something I’ve been fighting on and off for at least a year and a half. From now on, the new parachute packing method will be used for all launches. Vega is also equipped with a new method of deploying the main parachute, a device made by Archetype Rocketry called the “Cable Cutter”. The Archetype Cable Cutters worked like a charm. The Cable Cutter works by binding the main parachute using a plastic cable tie. When the altimeter in the rocket (Vega) senses that it is at the proper altitude to deploy the main parachute, voltage is applied to the igniter in the Cable Cutter. This ignites a small amount of Triple-7 type “black powder” to drive the cutter, which severs the tie, freeing the parachute to deploy. This system works so well, I am looking to use it in the next mid power dual deploy rocket, and to possibly use in a level 1 rocket. Vega’s next launch could come as early as two weeks while some of the components are finished & design tweaks are performed. At the end of the day, a VERY smooth roll-out of a new design to add to the Perseus rocket line!